Browse > Home / Past Events / Let’s talk about SCHMOOZE! The sun was out, the drinks were cold and there was plenty of vodka to go around thanks to the event sponsor, Belvedere Vodka. 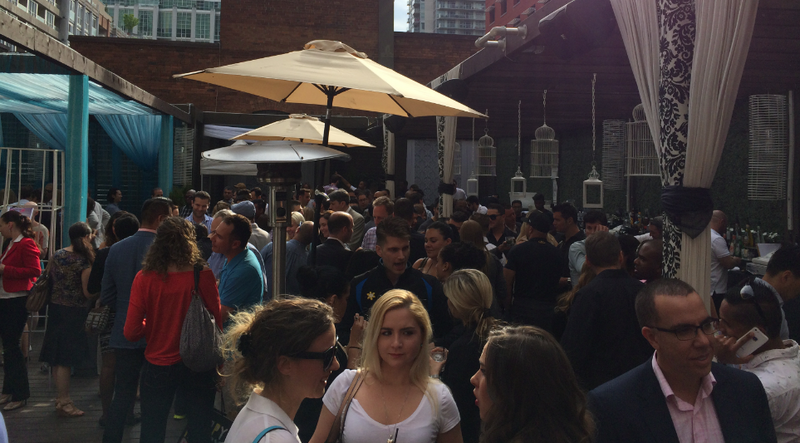 Thank you to everyone who came out to the kickoff party for this summer’s SCHMOOZE at Maison Mercer. I arrived just before 5 pm, and there was already a lineup of people waiting to get inside! Once we were in, it was so nice. The Maison staff had set up all of the booths and the staff was all very pleasant and accommodating. As soon as it started it was pretty busy but after an hour there were so many people! It was great to see some familiar faces and so many new ones too. The food, courtesy of Treeline Catering was unreal. I saw mini burgers and chicken skewers, which were delicious. People were lingering around the BBQ and it seemed just as the guy was done preparing the food, it was gone so I’m glad everyone enjoyed it! The sun came out just in time for SCHMOOZE and people seemed to enjoy being able to relax after a long week of working. It must have been a long week judging by the amount of jagerbombs I saw being passed around! Maison’s patio is the best spot for a warm evening and the DJ was playing some classic summer tunes to really kick off patio season in Toronto. My staff was able to snap a few pictures before it got dark. Check out the link below and see if you can spot yourself in any of them! And if you weren’t able to make it this time, don’t worry. 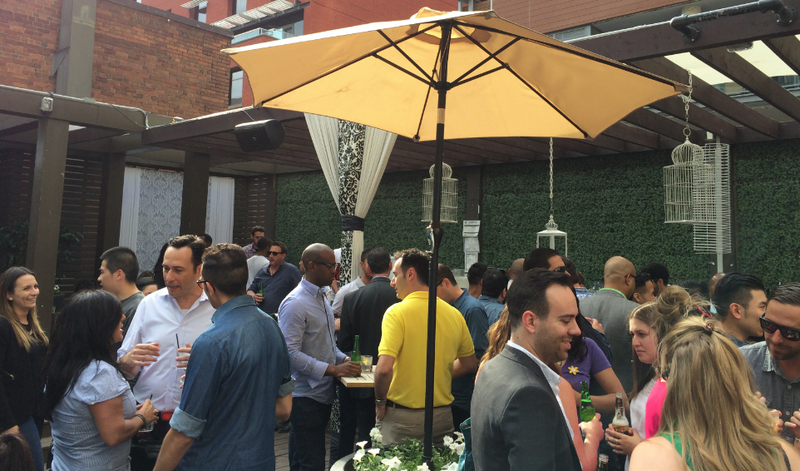 SCHMOOZE is happening each and every Friday until the end of summer on Maison’s rooftop patio. 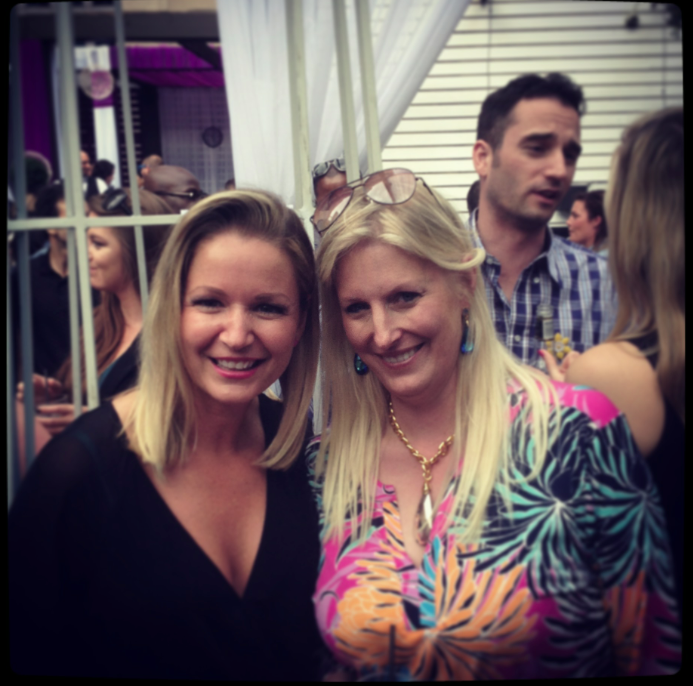 However, if you want to see me and Shanny in the City (which I know you do) we’ll be there again June 26! Same deal as last time. We’ll be having drink specials (who can pass up $4 drinks??) and a complimentary BBQ before 630 pm. We’re so happy everyone came out and we can’t wait to see you again in June!